In 1849 Mr Doddridge established a Blacksmith’s Shop on this land and after being granted a licence he opened the NEW INN .Times have changed since the original “ pig eating contests “ and so has its name . 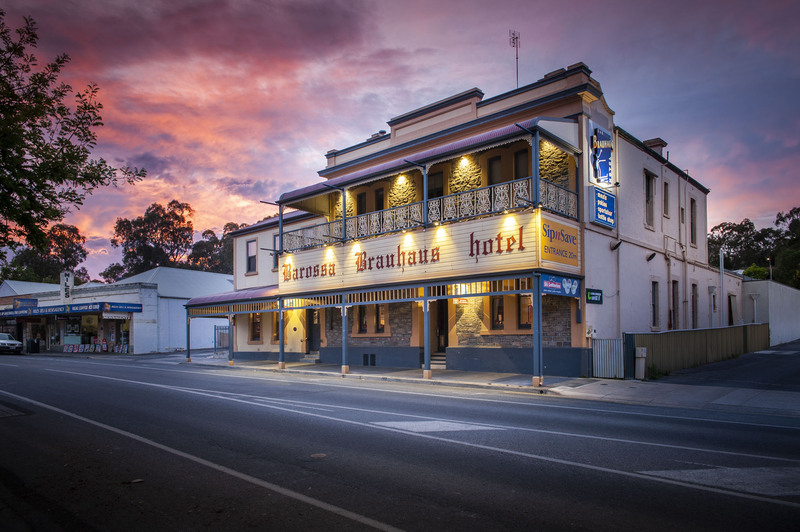 It has been named THE COMMERCIAL , BAROSSA HOTEL and finally the BAROSSA BRAUHAUS HOTEL since 1979 . Originally a single storey hotel , it was extended in 1870 and then again in 1911 in anticipation of the railway coming to town . The hotel was purchased by Andrew & Chris Plus in 1998 and has been extensively renovated since . Today the hotel has a large Drive in Bottle shop with an extensive range of wines over 3 levels, A Sports Bar , TAB , Lotteries and large Gaming Room. There are also three Dining areas offering a large a la carte menu , daily specials and promoting local produce. Upstairs there are six traditional hotel rooms with a shared balcony looking over the Main Street . © Copyright 2019 Plush Group. All Rights Reserved.